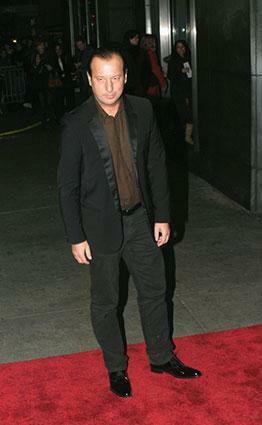 Fashion Designer, Helmut Lang (1956- ), was born on 10 March 1956 in Vienna, Austria. When he was three years old, his parents divorced; he then lived with his grandfather, who worked as a shoemaker in a village near Salzburg. Lang first took commercial courses at a local trade academy before he switched over to fashion design. Lang opened his first studio in 1977, when he was twenty-one years old, and designed T-shirts and jackets. He soon started to specialize in avant-garde fashion; by the mid-1980s, his women's ready-to-wear collections had become well known in his home country. He launched his first catwalk show in Paris in 1986, nine years after the opening of his first atelier. His minimalist approach was labeled as deconstructionist and avant-garde. In 1987 he also began to design men's wear, and promoted an essentially pure urban style. After Lang's success in Paris, he divided his time between his design studio in Vienna and his consulting agency in Paris. Lang was appointed professor of fashion design at Vienna's Universität für Angewandte Kunst, a college-level institution for the applied arts, in 1993. Lang's minimalist approach was also apparent in his marketing strategy. The best example was the appearance of his Internet web page in the early 2000s. At first glance, a visitor might have thought that the designer's web domain was under construction. The page was almost completely empty; several small links provided access to his current ready-to-wear collections for women and men, accessories lines, store information, press images, and perfumes. Lang's marketing created a set of futuristic images. For example, his web page for women's perfumes featured a series of distinctive phrases in large capital letters that scrolled rapidly past the visitor's eyes: I walk in-I see you-I watch you-I scan you-I wait for you-I tease you-I breathe you-I smell you on my skin. His advertising was also minimal, with simple product shots that appeared surprisingly clean and therefore remarkable. Lang tried to make the reader "breathe" the fashionable quality in his advertising. The caption for an advertising campaign for Helmut Lang Eyewear read, "To promote an intellectual and fearless appearance," showing a "mug shot" of a model's face. While other brands put the designer himself in the foreground to promote collections, Lang avoided attracting attention to himself. When Lang was asked in an interview what his label represented, he replied, "It says Helmut Lang on it. Everything I know is in it." His catwalk shows were presented in a clean, urban minimalist style. In fact, his 1998 collection was shown only over the Internet instead of being displayed in a physical setting. Claire Wilcox's introduction to Radical Fashion described Helmut Lang clothing at its simplest, as defined by a sophisticated interpretation of utilitarian wear. His clothes certainly resembled a uniform for urban living in the early twenty-first century. Lang had a preference for combining unusual materials: he blended cheap materials with expensive fabric, recycled fabrics with high technology. The fabric combinations varied from shiny to matte; they were often a mixture of natural fibers and synthetics. Lang sprayed silver and black varnish on denim in his 2000 collection, transforming basic utility into futuristic objects. His designs did not appear loud, but clearly reflected an androgynous style. A clinical look resulted from a mixture of deconstructionist and classicist forms that united contradictory elements. In "Imagining Fashion," Alistair O'Neill suggested that Lang's work could be understood as an attempt to liberate repressed attributes by concealing them under the supposedly unreadable surface of clothing. O'Neill took the advertising "Man in a Polyester Suit" as an example of Lang's suggestion that the surface of clothing is unreadable. O'Neill suggested that the phallic quality of the image reverberated in subsequent Lang campaigns, but it was the tension between the standard exterior and spectacular interior that came to the fore. Although the era of minimalist fashion design ended in the early twenty-first century, Helmut Lang still used minimalist codes in his designs. His androgynous approach to fashion mirrored the clear distinctions between male and female dress in traditional clothing. Lang was stereotyped as the "King of Fashion Minimalism." It is true that the concept was as important to him as the clothes themselves. This concept was also reflected in his color palette, which mixed noncolors with flashy shades to produce a futuristic effect. See also Brands and Labels; Fashion Advertising; Fashion Marketing and Merchandising; Jeans; Unisex Clothing. O'Neill, Alistair. "Imagining Fashion-Helmut Lang and Maison Martin Margiela." In Radical Fashion. Edited by Claire Wilcox. London: V & A Publications, 2001. Wilcox, Claire. Radical Fashion. London: V & A Publications, 2001. Helmut Lang Website. 2004. Available from http://www.helmutlang.com .